My friend Monica gets a little confused with my three cats. It's hard for her to tell them apart. As their Master, I find it easy to know each of my three cats but that's because I live with my babies and I see them every day. I thought a picture of my three cats here will help shed some light on which one is which! The grey one right in front looking a little grumpy is Chubbs. He is the oldest of my cats. Then comes Benji, the fat cat right behind. And last of all there's little Phoebe and I'm sure you can tell by her sweet face that she's a girl! Can you tell my cats apart? hahahha.. i sure can tell them apart.. Mon.. can you?? lol!! Sign in here Shemah? Ur comment is showing up as Shemah…. Oh no why la speechless maria Victoria??? yeah.. i just had to type my name cepat2 marzie for the first comment. if i terus letak smiley and submit it would be as guest. so type nama fast2 baru bleh chop!! LOL! risau gak didn't get the chop!! LOL! LOL! Can chop as guest then type in name after dat ha ha! Hey, with this chop u have broken the tie with Rizal and now u are TFC3! Meow meow! they all look cute Marzie. yum yum lah Starbucks Iced Latte!!!!! Just in time for MM sweetie! Yeah treating myself to a yummy iced latte! Hahahahhaah yeah la, Sandman oso couldn tell them apart like u it seems, but now he knows which is which LOL! CHubbs grumpy cause waiting for wet food, just gave them yesterday! 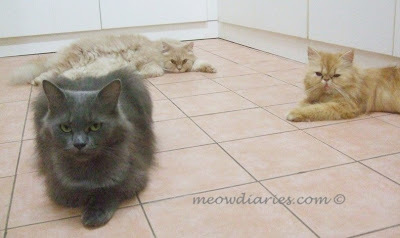 You’re welcome Monica, of coz must post this for u, so u can have a clear pic of all three cats sitting together-gether LOL! LOL! It’s going to be Monday in 2 minutes ha ha! get ready to chop! LOL! He he I always take pics of my kitties, but of coz must choose the best ones to show off here, meow! I am always confused as to why you refer to yourself as "master" - certainly you are not the master of your cats. Cats don't allow that. I find the term offensive. Perhaps I am being overly-sensitive. Or I am misunderstanding something? ohhh how's yr connection today? I just got back online, while replying MM comments just now I got disconnected until ten mins ago! Yeah some more still dropping here….150 more then Im done dropping 900! Phoebe is the sweetest, with dat cute lil nose. Benji... I nak peluk la coz he's so fluffy wuffy like a comfy pillow! The IF for this week is idle! I found the largest cow or bull while I was out on my way to town today. He or she really got into posing for just a little while. I haven't decided yet if I will post it for tomorrow or wait. After all, my 2 new movies just arrived from Netflix and my lasagna is done. Mmmmmmmm lasagna while enjoying a movie, sounds perfect to me Jackie! Hope to see that huge cow or bull soon LOL! Oh they sure are sweet.